The cabinet next to my stove is very narrow and while it was the best cabinet to keep spices, it was not the most functional. It stored all of my spices, but I couldn’t see or find anything. One day while browsing in Target something caught my eye that looked like the answer to my problem. A lazy susan. Brillant! So I bought two. 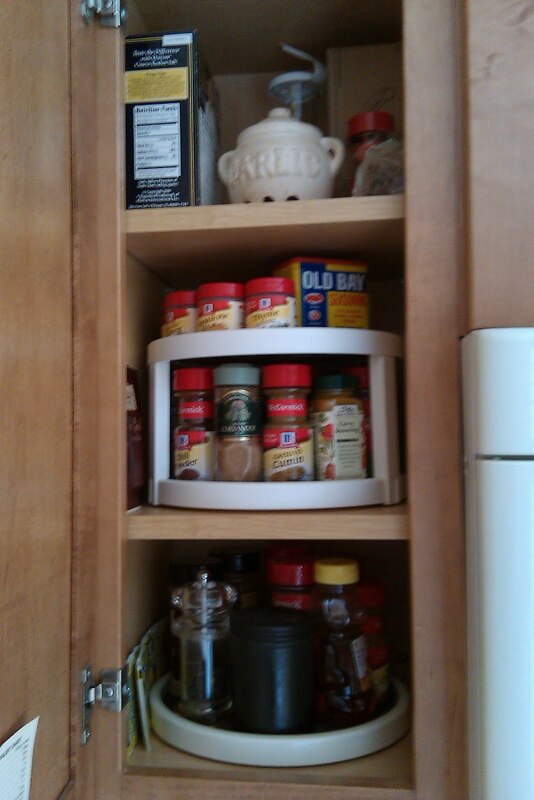 I alphabetized the spices to make them easier to locate. 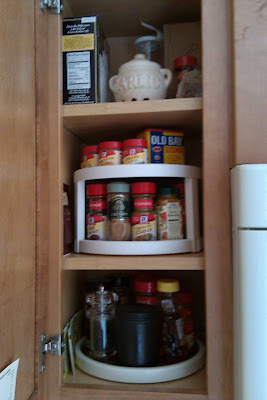 The taller bottles go on the lazy susan on the bottom shelf and I keep the shorter and medium sized bottles on the two-tiered lazy susan on the second shelf. Every spice now has a place. I can see them clearly and I don’t have to worry about finding a 12 year old bottle of cayenne. How do you organize your spices? Let us know in the comments. I need to get some organizing done in that cabinet as well, but we’ve got 2 cooks here, so no matter what I do, they’d get back disorganized the next time someone else uses them.